About Gander Green Lane Sutton United moved into The Borough Sports Ground (Gander Green Lane) in the 1912/1913 season (It was called the Adult School Sports Ground at the time), although were only there for a year before moving to a field in Grove Road called The Find. Sutton’s first match at Gander Green Lane was against Guards Depot in the English Cup (FA Cup) and it finished one goal each. A crowd of over 800 watched the first league match at the ground, against Redhill, Sutton winning 1-0. Sutton moved back into Gander Green Lane after World War I and the first post-war match was played against Page Green Old Boys on 30th August 1919 with around 400 people watching Sutton win 4-1. In the 1950/1951 season plans had been drawn up for building a new grandstand, at an estimate cost of £3,000. The Grounds Improvements Committee had been busy during the year and had gained the use of the land neighbouring the railway, on which a car park had been constructed. Using railway sleepers, construction of a new terrace was also well advanced. The Borough Council put up £1,200 as part of the Coronation celebrations on condition that construction of the stand was finished on schedule. A considerable saving was achieved through volunteer labour, notably digging three dozen holes, each 6 ft deep and 4 ft square, all filled with concrete. Architects’ plans for the completion of the new grandstand by constructing full accommodation below were examined, at a cost of £10,000 for the work. The local Council agreed to provide a loan to enable the costs to be met. In the January of the 1962/1963 season the club was invited to join the Isthmian League and £5,000 was spent on new floodlights. The summer after the championship winning season of 1985/1986 a group of volunteer supporters cleared away the wooden sleepers behind the goal at the Collingwood Road end of the ground, to allow a new concrete terrace to be constructed. 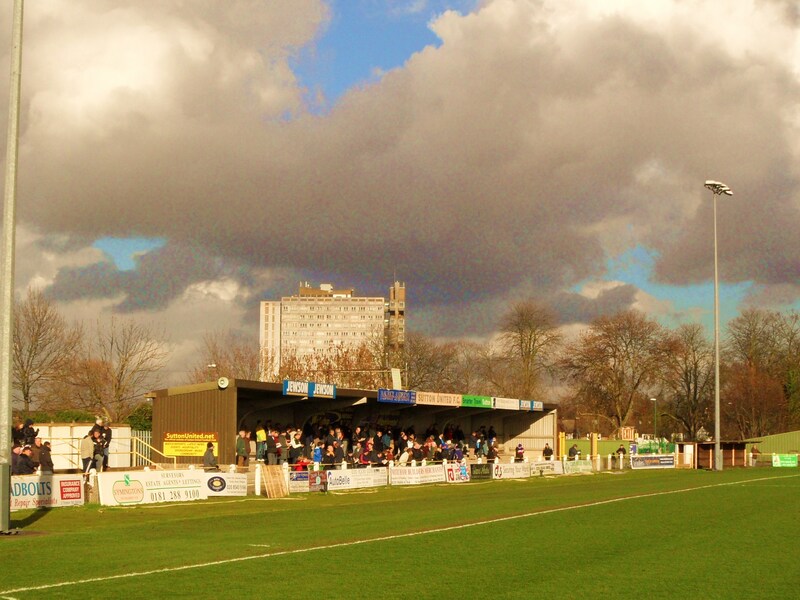 Next, the perimeter fence and main stand were painted before the changing rooms were redecorated. In late February of the 1996/1997 season construction work started on the Securicor terrace and was completed in late March. Supporters were asked to help meet the costs of the work through a scheme called “Buy A Brick”, and the list of contributors is preserved in a plaque attached to the back of the structure. “Buy A Brick” raised in excess of £7,000. In the summer of 2000/2001 new floodlights were installed at the ground. There have also been other small changes to the ground over the past few years, like a new tea hut for Rose was put in at the same time as the floodlights. The club shop moved from it’s location next door to the refreshments hunt next to the stand to a porta cabin next to the Securicor terrace because it out grew it’s old building. There was also a new drainage system put in during the same time as the new floodlights and other little things here and there to keep the ground in shape. The club continues to improve the facilities at Gander Green Lane and have plans to square off the Collingwood Road End of the ground but currently do not have the funds to do this, and also other small improvements to make sure the ground keeps it’s safety certificate and ground grading. The record attendance for Gander Green Lane is 14,000 and was set when Sutton United played Leeds United in the FA Cup in the 1969/1970 season How to get to Gander Green Lane If you are coming around the M25 go to junction 8. Then north on the A217 for about 15-20 minutes. Ignoring signs for Sutton itself, stay on the A217 to the traffic lights by the Gander Inn (on the left), turn right into Gander Green Lane. The Borough Sports Ground is about 200 yards up this road on the left hand side, if you reach West Sutton station you have gone too far. There is parking for around 200 cars behind the grandstand. Alternatively, street parking is plentiful. West Sutton railway Station is adjacent to the ground. It is served by Thameslink trains via Wimbledon or Sutton. Come out of West Sutton station and turn right into Gander Green Lane and the ground is about 100 yards further along. The 413 hoppa Bus service runs past the ground down Gander Green lane. The bus will stop on request anywhere in Gander Green Lane. The bus leaves Sutton Town centre from outside the main post office. The 80 route from Hackbridge to Belmont runs down Collingwood Road. The ground can be reached by taking the path through Collingwood Rec. Buses cost £1.20 for adults and 40p for children. All children under 11 travel free. Admission to Gander Green Lane It’s £10 for adults, £5 for concessions and £3 for juniors at Gander Lane with a £1 transfer to the seated Grandstand. Programmes are available inside for £2.50. 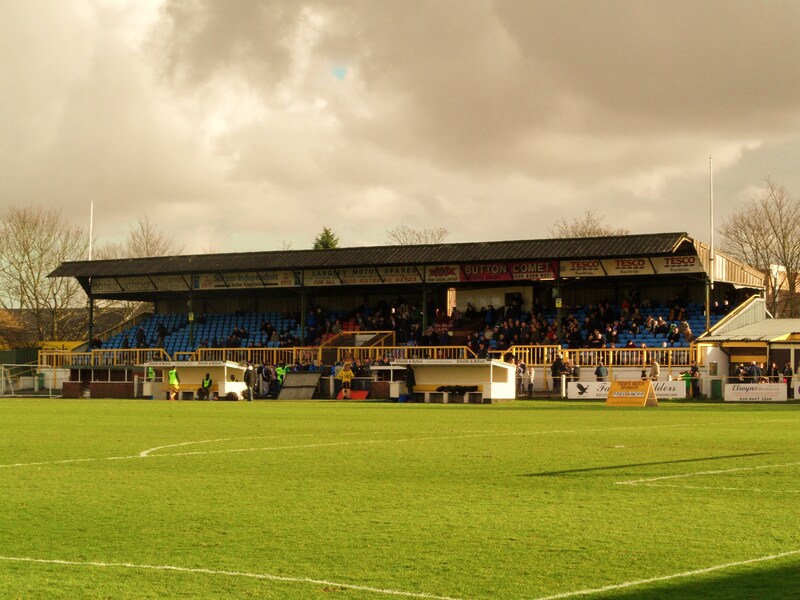 Our last visit – February 2011 On Saturday 7th January 1989 the world of Sutton United changed forever. On that historic day at 5pm over 8,000 fans celebrated the fact that they had just beaten Coventry City, playing in the top level of English football in the FA Cup. The same Coventry City who just 600 days before had held aloft the FA Cup at Wembley Stadium. Whilst everyone remembers Sutton from this game, they also had their day in the FA Cup sun back in 1970 when the club made it through to the Fourth round, having beaten Dagenham (before they found Redbridge down the back of the sofa), Barnet and Hillingdon Borough in the previous rounds. They were then drawn against the mighty Leeds United, League champions and on their way to the FA Cup final. Under Don Revie there was no way that they would come unstuck against a Non League team (12 months later they lost THAT game to Colchester United though), and a 6-0 victory in front of 14,000, still a record attendance for the club. Not that their cup exploits have all been in the premier competition. The Amateur Cup Final, the FA Trophy Final, the Surrey Senior Cup and the Hitachi Cup Final no less but perhaps their best honour was winning the 1979 Anglo-Italian cup aka The Alitalia Cup when they beat Chieti in the final becoming the only non league cup to win the much derided trophy. Today Sutton United are a fish out of water. They are undoubtably the biggest team in the Ryman Leagues. Regularly getting attendances of over 500 and in recent years somehow failing to take advantage of their first half form in the league by falling away at the business end. Last season for long periods they ran Dartford close, only to resign themselves to a second place finish. However, they were stunned by Kingstonian in the semi-final at Gander Green Lane when their local rivals ran out 4-2 winners, denying Sutton a place back in the Conference South where they were up until 2007. This season, with two-thirds of the season completed they still sit on top of the Ryman Premier. Perhaps this season would see them move back up into the Conference South, a table they deserve to be playing at, based on their support base, and history in the non leagues. We were long overdue a visit to Gander Lane. Just 11 miles from TBIR towers and sitting in the magic triangle including Carshalton Athletic and Tooting & Mitcham United, it was unbelievable that we had not visited the club before. But once we had decided to pop on down we were welcomed with open arms by the club. And what better game could we have chosen. Visitors Lowestoft Town were on a bit of a run themselves. Last seasons Ryman League One North champions they had carried on their exceptional form based on some great attacking play to challenge for the top spot this season. Sitting in fifth place with four games in hand on Sutton and 14 points behind, this was certain to be a battle of the big two in the division, with Lowestoft having one of the biggest away followings in the league. Sutton United 2 Lowestoft Town 1 – Gander Lane – Saturday 12th February 2011 Games like these sometimes decide outcomes more than you could imagine. The two one win for Sutton United not only extended their unbeaten run, but also pushed Lowestoft out of the play off places. Did they deserve it? On the pitch it was an even match up but for off the pitch activities I would say Sutton deserved the win. But more of that later. The game kicked off with the rare red ball being used. With the BBC in attendance for a programme on Red Nose Day it was decided that all Ryman games would use the red ball. However, after twenty minutes, for some strange reason the referee decided to bring back the traditional white one. Not that it was the only strange decision that the referee Rubery made all afternoon. I rarely criticise officials as they have a difficult enough job but today Mr Spain was awful. First up he decided that Jenny the Giraffe was “interfering” with play by standing on the sideline, confusing the poor linesman and had her moved by the fourth official. I can see where the confusion may lay – She is 9ft tall and made of foam after all. Then with his first big decision of the day he failed to send off Lowestoft keeper Andy Reynolds when he brought down Craig Dundas as he tried to go around him on the edge of the box. Not content with that he then booked Sutton scorer Adrian Forbes high fived a supporter after scoring a goal and as he had already been cautioned he was off. And those were just a few of the many of screw ups during the ninety minutes. Sutton started on top and created the better of the opening exchanges with Forbes and Dundas coming close on a number of occasions so it was no surprise that it was the home side who took the lead. Dundas took advantage of hesitation between the two Lowestoft centre backs and went to round the on rushing Reynolds who tripped him deliberately. A cut and dried professional foul surely? Not according to Mr Rubery who only issued a yellow. From the resulting penalty Forbes made it one nil. The Lowestoft fans took it in good heart as they did with every decision that went against them. I have been to enough football games in my time to have heard abusive language but a small section of their vocal support frequently took it too far. This was Gander Green Lane in front of 800 people, not Boca Juniors v River Plate in front of 60,000. The rest of the half was dominated by Mr Rubery. Play was allowed to continue when it should have been stopped and vice versa. Sutton did nearly extend their lead when a header from Griffiths struck the bar. Lowestoft were pegged back for most of the first period, unable to get the ball to the feet of the dangerous Forbes. Half time approached so we headed for the bar. However, the entrance to the bar is shared with the tunnel here at Sutton, and so dozens of thirsty fans had to wait until the players had gone back to the dressing room. Priorities right? And then when we eventually got into the bar it was packed. I saw a sign pointing us in the direction of a second bar, the Time Square bar, which bizarrely was closed so we had to go thirsty. Non League football and beer should go together like strawberries and cream at Wimbledon but not for us today. Lowestoft came out for the second half much stronger. They took the game to Sutton, knowing that a win here would close the gap between the two clubs to almost striking distance. The Lowestoft “minority” took the opportunity to start abusing everyone around them. Players, officials, fans and even a certain fictional BBC soap opera! The irony of it all was that the main “singer” was wearing a Russian winter hat, made famous more recently by West Ham’s owner David Sullivan, who is a, er Cockney. 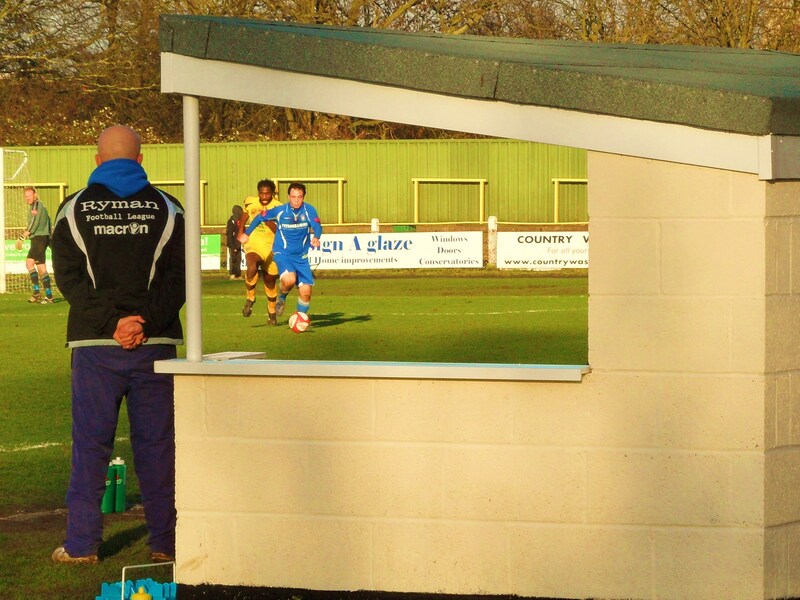 On fifty three minutes Sutton made it two nil as Forbes tapped in after great work by the impressive Dundas. He celebrated by running behind the goal and high fiving a home fan. Forbes had been booked moments before and so the referee deemed his action “inflammatory” and issued a second yellow card. Apparently. You see I didn’t actually see that bit. I saw him pull out a yellow, but never saw a red, nor did I see Forbes leave the pitch. In a trueChris Kamara moment I did not find out about this until some hours later when I read the official report. Lowestoft saw this as their moment (it explains a lot now) and pushed forward in greater numbers and got a goal back when Mitchell’s shot from 20 yards got a big slice of luck with a deflection and the ball was in the back of the Sutton net. They then put the Sutton goal under siege for the rest of the game, and should have got an equaliser when they appeared to have scored, only for the linesman to flag for offside. These incidents happen all over the country every week, and whatever the rights and wrongs of the decision did it really require three or four of the Lowestoft fans to run, and I mean run, from one side of the ground to the other, just so they could launch some sustained verbal abuse at the linesman. The frustration got to the players as well with one Lowestoft player aiming abuse at a ball boy of no more than 10 years old for failing to retrieve the ball quick enough. I assume that he has yet to sign up to the new FA-Based initiative Respect FC. Time ran out for the visitors and at the end of the game the players surrounded the officials to try and understand the bizarre decisions. It was a shame as this was a great game of football, played out in front of a passionate crowd, yet was spoilt by an official who really didn’t want anyone else to be the main attraction apart from himself. For Sutton it was another win against one of their rivals, whilst for Lowestoft they showed that they have enough about them to compete in the higher levels of the league. And for me? A lift home thanks to the wonderful CMF who was waiting outside. For more pictures from the day click here to see our Flickr feed.